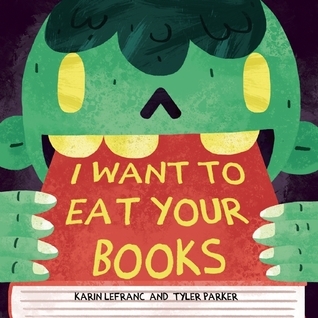 I Want to Eat Your Books by Karin Lefranc and Tyler Parker was a fun read to get us in the mood for Halloween. Eric is followed by a zombie to school, but rather than a brain-sucking zombie, he’s chased by a book eating zombie. Halloween allows the dark and scary to surface in town, and Eric is scared when the zombie approaches. When the zombie eats his book, the kids and teachers are running scared and trying to save their books. From fiction to nonfiction, this zombie does not discriminate. However, teachers would prefer if this zombie kid would read the books, rather than eat them. Once in the library, the zombie is enlightened to the power of reading. Eric hands him a book that changes his outlook. While he is a zombie, he has manners and asks that Eric read to him. This change is magical, and soon he’s devouring books in a completely new way. Someone on the paranormal wire must have heard about the goodies in the library and passed along the news, because soon the school library is attracting mummies and zombies. I Want to Eat Your Books by Karin Lefranc and Tyler Parkeris a fun book about the power of reading, and the knowledge that books can provide. My daughter and I took to shouting, “I want to eat your books!” as the zombie made his way through the school, and by the end we were giggling. This book is sure to create bookaholics like me. 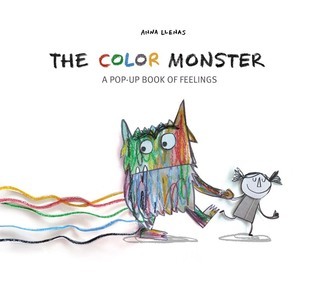 The Color Monster: A Pop-Up Book of Feelings by Anna Llenas from Sterling Children’s Books for review. We teach toddlers to identify colors, numbers, shapes, and letters—but what about their feelings? By illustrating such common emotions as happiness, sadness, anger, fear, and calm, this sensitive book gently encourages young children to open up with parents, teachers, and daycare providers. And kids will LOVE the bright illustrations and amazing 3-D pop-ups on every page! 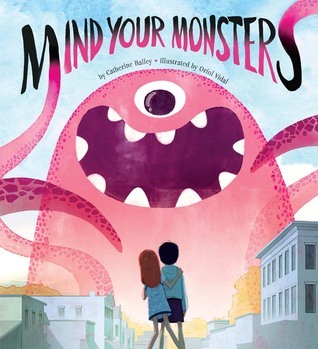 Mind Your Monsters by Catherine Bailey, illustrated by Oriol Vidal from Sterling Children’s Books for review. Vampires and werewolves and zombies—oh my! It’s a monster invasion, and the stinky-smelling creatures are destroying Wally’s peaceful little town. They scare the kids, knock over the lampposts, and make a mess of everything. And no one can stop them—until, fed up, Wally says . . . the magic word, “PLEASE.” Learning good manners has never been as monstrously fun! Monster Trouble! by Lane Fredrickson, illustrated by Michael Robertson for review from Sterling Children’s Books. 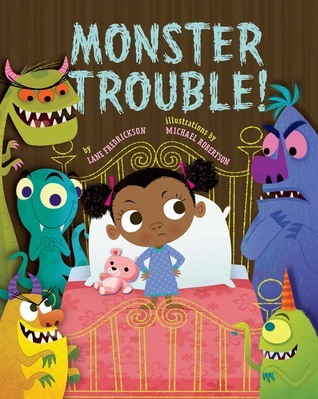 Nothing frightens Winifred Schnitzel—but she DOES need her sleep, and the neighborhood monsters WON’T let her be! Every night they sneak in, growling and belching and making a ruckus. Winifred constructs clever traps, but nothing stops these crafty creatures. What’s a girl to do? (Hint: Monsters HATE kisses!) The delightfully sweet ending will have every kid—and little monster—begging for an encore. 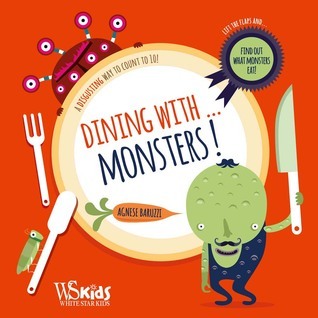 Dining With … Monsters: A Disgusting Way to Count to 10! by Agnese Baruzzi from Sterling Children’s Books for review. What do hungry monsters like to eat? 1 spider swallowed whole, 2 leaping frogs, and 3 entire whales for the ogre with gigantic claws and scales! And for Mr. One-Eye, four mice are very nice. Kids will enjoy this fun feast of a counting book, with 10 colorful creatures and their meals of grasshoppers, scorpions, owls, and prickly porcupines. Foldout pages and simple, humorous rhyming text make this a delight to read aloud. 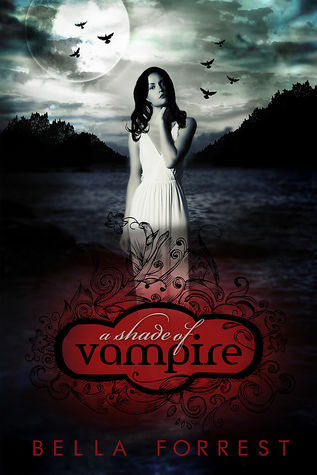 A Shade of Vampire by Bella Forrest, which I got for 99 cents on a Kindle sale. She is kidnapped to an island where the sun is eternally forbidden to shine. An island uncharted by any map and ruled by the most powerful vampire coven on the planet. She wakes here as a slave, a captive in chains. Sofia’s life takes a thrilling and terrifying turn when she is the one selected out of hundreds of girls to join the harem of Derek Novak, the dark royal Prince. Despite his addiction to power and obsessive thirst for her blood, Sofia soon realizes that the safest place on the island is within his quarters, and she must do all within her power to win him over if she is to survive even one more night. 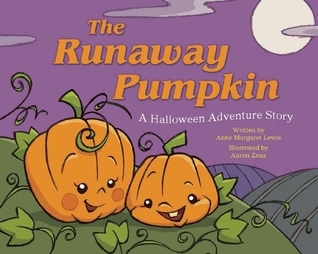 The Runaway Pumpkin: A Halloween Adventure Story by Anne Margaret Lewis, Aaron Zenz for review. A cute little Halloween pumpkin announces that he is ready for a Halloween adventure. So he prepares to set out on the exploration of a lifetime. However, his ever watchful and caring mother wants to make sure he’s prepared before he takes that first step outside. The little pumpkin will begin his adventure on a witch’s broom, where he will fly through the skies. Next, he’ll dare to venture through the very spookiest haunted house. And to celebrate the night, he’ll dance to the “Monster Mash”! It’s scary out there on Halloween night, but his mother is packing a parachute just in case he falls, a blankie for reassurance, and his favorite monster shoes so he can boogie-woogie all night long. Whatever adventures he has, he is sure to be prepared. Halloween isn’t so scary when you have a mother pumpkin making sure you’re ready for whatever frights might come your way! I Want to Eat Your Books by Karin Lefranc, Tyler Parker for review. He’s limping strangely down the hall with outstretched arms and a groaning drawl. A zombie! Could it really be? You race to class, but turn to see he’s sitting in the desk right next to you! But odds are you’ll probably be okay, because this is no ordinary zombie. This zombie doesn’t want to eat your brains—he wants to eat your books! Hide your textbooks and your fairy tales, because the little zombie is hungry and he doesn’t discriminate between genres. Will the school library be devoured, or will the children discover something the zombie likes to do with books even more than eating them? Ava the Monster Slayer by Lisa Maggiore, Ross Felton for review. 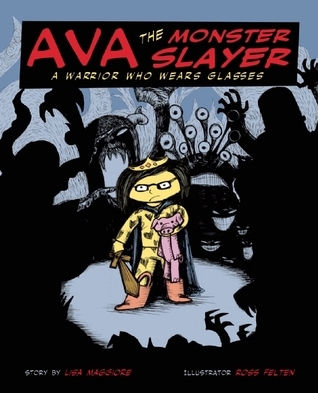 Don’t underestimate Ava just because she’s “cute” and wears “adorable glasses”—she’s really a fierce monster slayer. And when her beloved Piggy is left in the dryer in the basement, Ava knows she’ll have to face the ferocious monsters lurking in the dark if she wants to rescue her favorite stuffed animal. So she puts on her brother’s superhero cape, grips his sword tight, puts on her pink rain boots and sparkly princess crown, and creeps downstairs. Not even the roar of the greenest and hairiest monster is going to stop this spunky girl. Even though she’s scared and the monsters smell terrible, Ava is determined to rescue Piggy. Ross Felten’s brisk, sketch-like illustrations help bring energy and humor to this story of bravery and loyalty. Young readers will relate to Ava’s mission and delight in her victory over the monsters. Ava the Monster Slayer is sure to appeal to children worried about monsters in their own homes and kids devoted to their own stuffed animals.